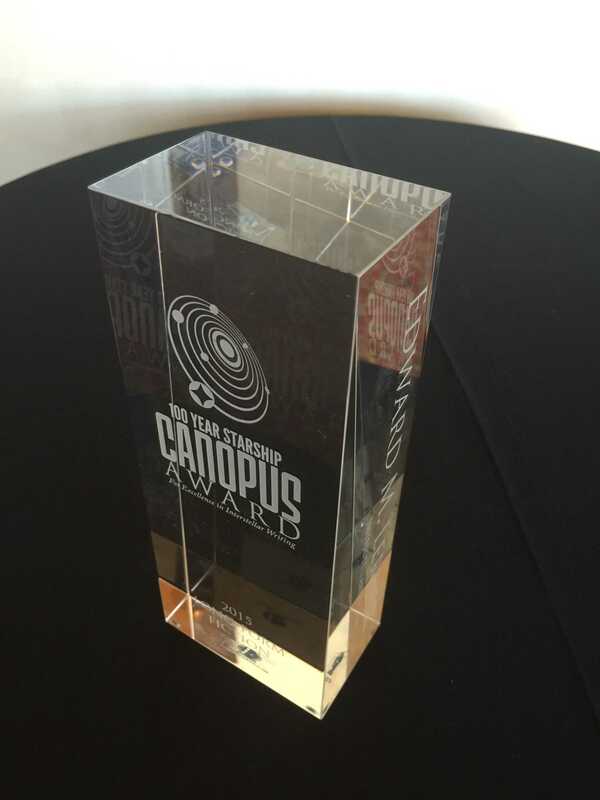 The 2016 Canopus Award for Interstellar Writing, established last year by 100 Year Starship, is open for nominations or submissions in seven categories through August 30, including two new categories for college work. This year’s theme, “Near Steps to Interstellar,” explores what steps can or must be accomplished in the next five to 10 years to ensure successful human travel beyond our solar system to another star. Achieving the capabilities for a human interstellar journey by 2021 will demand discontinuous, radical advances. It also will require incremental progress be made in our knowledge of engineering, economics, social structures, biological systems, sustainability and commitment. Finally, the reality is that the vast majority of people and their descendants will remain on Earth. So, all along the way, how will the advances we make to get to the stars be exploited and impact life on Earth, our home planet? Open nomination. The public can nominate works here at canopus.100yss.org. The open period for nominations is June 27 through August 30, 2016. Open submission. The public can submit works via their website here at canopus.100yss.org. The open period for submissions is June 27 through August 30, 2016. Nominations for the Previously Professionally Published categories can be made here. Original work can be submitted here. Submit original college work here. The Original and College Original category works must be original, meet established standards of quality writing, and have a significant component of interstellar exploration, research, and/or travel with a focus on pushing radical leaps in knowledge and technology while pioneering and transforming breakthrough applications that enhance the quality of life for all on Earth. The Original and College Original category work are also encouraged to focus on the pillars of 100 Year Starship’s mission: Audacious, Resilience, Inclusion, Enhancing Quality of Life, Discipline, Energy, and Knowledge. Five finalists will be selected from each of the seven award categories and will be announced in September. Canopus judges will then select one winner from each list of finalists. Winners will be announced and honored during a special award ceremony at 100YSS’ annual public event. Prizes include a crystal award, cash, publication, sponsorship to 100YSS special events and programs. This entry was posted in Awards and tagged 100 Year Starship, Canopus Award by Mike Glyer. Bookmark the permalink. Hmm. Let’s just say that while I find the 100 Year Starship foundation an admirable endeavor, and I enjoyed attending the Symposium last year, I would be . . . cautious about submitting original work to this competition.